In this journey to become a better version of ourselves, a lot of times we struggle to feel worthy and satisfied with our efforts. We end up comparing ourselves to others, feeling overwhelmed and doubting ourselves. This question pops up in your mind every now and then, distracting you, tempting you to give up. Even after doing your best, you feel like you are not working hard enough. You have the fear of not living up to your "expectations". As a result, you end up constantly undermining yourself. While it's important to have the drive to improve yourself, you should avoid being too self-critical. Continuously stressing about being perfect keeps you from performing optimally. By constantly aiming for perfectionism, you end up putting too much pressure on yourself. When you focus too much on being perfect, you always feel like you are inadequate, despite the amount of effort you put into your endeavors. The desire to be perfect all the time leads to an obsession with wanting things to go exactly according to your wishes. You become hesitant to try new things, thinking "if I can't do it perfectly, then why do it at all?" This attitude stops you from harnessing many worthwhile opportunities. Wanting to be perfect all the time makes you doubt your abilities as you put yourself under scrutiny all the time instead of motivating yourself to grow steadily. You end up being too hard on yourself. However, when you acknowledge being good enough, you give yourself enough space to accommodate your flaws as well. Remember that we all have got to start somewhere. When you are starting out, and trying something out of your comfort zone, it's easy to feel intimidated. Progress takes time. It takes time to build your skills and get better at something. When you are starting out, you won't be perfect right from the beginning. And, it's okay if you are not perfect, nobody really is. If you keep bashing yourself for not being good enough, you cannot work on improving yourself. When you accept yourself the way you are now and accept being good enough, you achieve a positive mindset. You acknowledge the efforts you have put in your journey. You tell yourself whatever you have done until now is good enough and whatever you do from now on will be good enough. 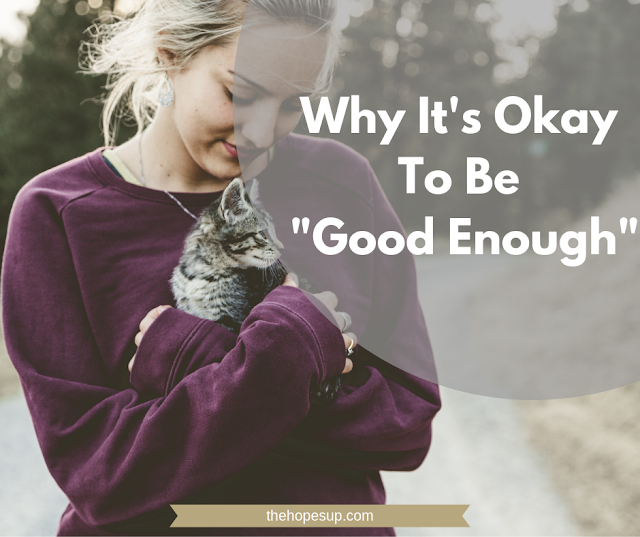 Accepting to be good enough allows you to breathe, re-evaluate your choices and decide how you can grow steadily. Remember that being good enough does not equal to being complacent. Accepting good enough means acknowledging your efforts and not being too hard on yourself or trying to be perfect all the time. We all want to become a better version of ourselves, but that doesn't mean you should loathe yourself for being the way you are now. The fear of being not doing enough stops you from being satisfied with your efforts. And if you are never satisfied with your efforts, then you will keep asking yourself - why am I even doing this? Aim to get better and work harder each day but not to the point where you feel exhausted and burned out. If you are happy with the way you are now and willing to work on improving yourself, you are more likely to get better results. Focusing on the positive aspects of yourself keeps you motivated and reminds you that you are capable of growing further and getting better. Instead of perpetually feeling like you are lacking in something, you feel like a more powerful version of yourself who knows what they are doing and is confident about their abilities. Sometimes you will get more done if you just let things be and accept good enough. Do you ever find yourself dealing with feelings of inadequacy? What do you do to overcome such feelings? And, if you liked this post, don't forget to share it with others.